According to Hana Shaf-Brener, Yosef Mirkes, a farmer, and his wife Ita had three adult children: a daughter, name unknown; and two sons, David and Aharon. Kehilat Shkud provides some information on the farm worked by Yosef Mirkes: “About five farmers cultivated their own their lands in Shkud, produced enough for private consumption and sold the surplus to the shtetl dwellers. Owners of large plots were: Neta Zelikovitz z”l, Bere Kaganzon and Joseph Mirkis – in the old town, and the brothers Mendel and Nachum Chatzkels, Hirsch Cohen and David Shafkind – in the New Town” (14). David Mirkes (probably a different David than the one referred to above) was one of Shkud’s pharmacists. His pharmacy, “Didzioji Vasitine,” was located in Gediminas Square no. 20 (Jews in the Memory 8, 28; see link on this page). The same document provides a few details on the Mirkes pharmacy: “I [the gentile interviewee] remember that there were a few pharmacies in town: their owners were Zilberstein, Mirkes, and Katterfeld. Medicines were quite expensive: one had to pay two to three litas for a basic headache powder. Assistants working in the pharmacies had a special education. They prepared most of the medicines in the pharmacies according to the doctors’ prescriptions. But while it was possible to obtain food in grocery stores and pay for it later, credit was not available in the pharmacies” (Jews in the Memory 25). The pharmacist David Mirkes was not killed in Shkud, but was deported with his family to Siberia: “In 1940, up to 7000 Jews, along with their Lithuanian neighbours, were deported to Siberia, among them Dovydas Mirke, a pharmacist from Skuodas” (Summary of Alfonsas Eidintas 6; see link this page). Boris Fogelman, deported with his family at the same time, recalls: “Other families were also deported [to Siberia] together with us, including the Mirkes family” (Jews in the Memory 33; see link on this page). Jewish Gen’s Lithuania Directories database notes that Chaja Mirkes and her family, from Skuodas, were “found in Russia,” so at least several members of the Mirkes family survived their deportation. Jewish Gen’s Lithuania Tax and Voters database indicates that the Mirkes family was already established in Shkud in 1849. I could find no specific references to any of the Mirkes individuals mentioned above, aside from an entry in the Yizkor Book Necrology database indicating that Yosef Mirkes was killed in the Holocaust. According to Jewish Gen’s Lithuania Directories database, Samuel David Mirkes of Simnas, Lithuania, received his Assistant Pharmacist Degree in Odessa, 1915. The Lithuania Marriages database records the 1919 marriage of Samuel Dovyd Mirkes, son of Maks and Chana (nee Kagan) of Simnas, to Chaja Freid, daughter of Mausius and Bliuma. 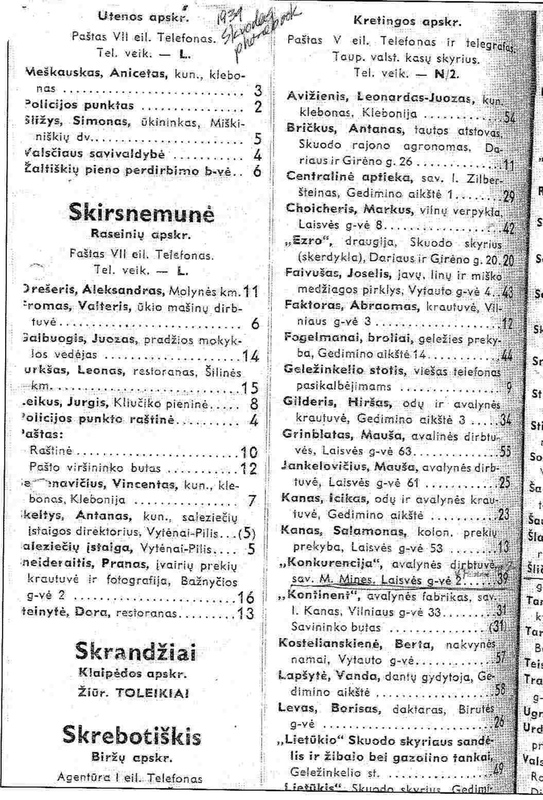 According to the Lithuania Marriages database, Samuel David Mirkes and Chaja Beile (nee Fried) had a son, Mouze, born in Simnas, June 14, 1928 . As of November 2013, Yad Vashem has no information on the Mirkes family of Shkud.